The western world is aging with a growing number of isolated elderly staying away from friends and family. They often have no one to talk to or share their lives with. Policymakers all over the world design special services to tackle these issues but it often does not reach the right person. Similarly, several people are willing to help but they lack connection within themselves. Hence, there exists a huge gap in the connection between the policymakers, helper community and the elderly in need. We approach interaction design, not with the intention to solve the problems but to create a platform that taps into human values and behavior. So we designed Ellay to bridge this connection gap leveraging simple interactions and creating a meaningful connection between the elderly and community. It’s a service that brings elderly closer to the community nourishing long-term relationship through shared moments. By showing a glimpse of your own life, through a short video clip and your voice, you can trigger someone else’s curiosity. Ellay gives the possibility for people to be a part of those moments with one touch. 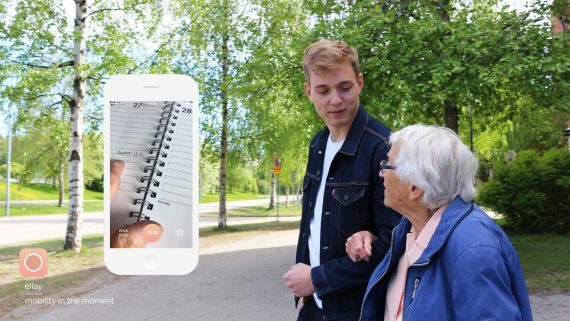 The platform creates relationships between the elderly and the community by sharing their stories, bringing people into their lives, and bridging the generation gap, which can eventually contribute to a long-term social sustainability. Unlike current social platforms which generally facilitates connections that we have already met in real life. We approach this problem in a more fundamental way. We architect the platform in such a way that it enables connection of people within themselves, not with the tools. For example, in the app, when the neighbor presses the join, he/she calls directly to the elderly. This enables a personal connection and reassurance, preventing any misuse or passive behaviors. Moreover, this makes it more than a volunteering app to a community building platform that fuels through the community’s curiosity; a platform where people connect gradually rather than having a transactional interaction. We believe that the future lies in the lived experiences and togetherness of the community.